Otherworld shenanigans on the local Fairy Path. 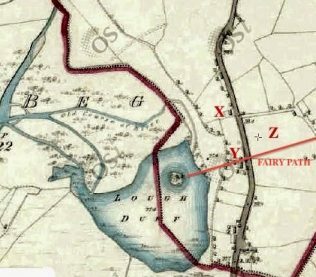 The 1829 Ordanance Survey Map of the area depicts Lough Duff with the island & tree. Our home is marked X, the wooden cabin Y & the second field Z. The old wooden post marking a corner of the original dwelling perhaps. The end of the house where the Fairy Path runs & the overgrown For Sale sign. I have written before about the Lough Field and the stories told to me by my late neighbour, Jim. One particular tale, which he received from his mother, concerned the local Fairy Path. Before the River Barrow was re-routed there was a lough near to our home, Lough Duff, ‘ dark lake’ containing an island upon which stood a fairy thorn. It was known that the local Sídhe had their home within the water and would gather at the tree to begin their travels across the country. Their route, the Fairy Path, crossed a small field, a road, a second field then continued eastwards towards another lough. No one back then would build on a Fairy Path as it meant that the occupants would never have any rest from the Good People. The way to avoid this was to stand four posts at each corner of a new site and leave them overnight. If all the posts were standing the following morning it was safe to continue, if any had moved or fallen it was acknowledged that the Sídhe objected and it was better to build elsewhere. Jim recounted that long ago a stranger came to the area and built a wooden cabin near to the roadside in the first field. Unfortunately it seems the man knew little of fairy lore as he built directly on the Fairy Path. After he moved in to his new home he would carefully close the doors, front and back, each morning before he left for work and when he returned in the evening both doors would be standing wide open. He couldn’t explain it but the locals knew what was happening. It was the Sídhe. He had built his house on their path and would never have a moment’s peace again. Whatever the man tried the doors would be open when he came home and eventually tiring of the Otherworldly shenanigans, he left the cabin to live elsewhere, allowing the structure to fall and the Good People to travel their path unhindered again. Our home, along the road, was also originally a wooden structure. 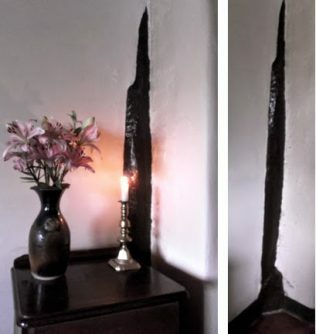 In the corner of the oldest part of the cottage stands a post, preserved by danish oil and wood hardener, with stone walls on either side.The previous owners maintained that it was the remains of another fairy thorn but that is unlikely given the beliefs of the time however, it may be one of the original posts erected to check that the site did not obstruct the Fairy Path. Many years later, in 2009, a man from a nearby town bought the field across the road from the site of the old cabin. His plan was to build a modern, two storey house, not to live in but to sell for a profit. When the architect came to look around we spoke with him and explained about the Fairy Path which cuts across part of the site. He nodded politely but told us it would make no difference, the new house would be built regardless. Sure enough building began a few months later and the ground floor walls were constructed. Not long afterwards we heard sounds coming from the house in the evening after the builders had left and several people reported hearing doors slamming where there were no doors. Shadowy shapes were seen passing the empty window frames at dusk. Jim had the explanation for what was happening: the Sídhe were unhappy with the construction and making their presence felt. In the past none had built on the old Fairy Path and remained there and none would do so now. Now, in 2015, the house is still unsold. I am artist living in Laois painting images of Irish Goddesses & Gods within myth, landscape and custom.